Rare Bird Books, a Barnacle Book, 9781945572999, 376pp. Tom Pistilini has just discovered he's an unwitting investor in a macabre tourism company bringing wealthy European sightseers obsessed with America's murder culture to explore mass shooting sites. It's a business that will make him wealthy, although he might just despise it enough to ruin his neighbors, and himself, financially. Told from the first-person perspective of unreliable narrator Tom "Pisser" Pistilini, the Patrick Bateman of the private school community, Therapy Mammals is the story of the lengths one father will go to protect his children, his marriage, and his worthiness. Pisser's life is a mess. He recently emerged from a pharmaceutical blackout to find himself strangling the captain of the high school lacrosse team against the bathroom wall of Gopa Academy, a premier Manhattan private school. His wife is having an affair with a motivational speaker. His job as Channel Fourteen's meteorologist is in jeopardy. His nanny died in a freak accident, of which he may have been involved. It is also possible he murdered the lacrosse coach with a four-iron. A group of millennial hackers has discovered the tourism business. He has a chipmunk infestation in his backyard. His wife's vertical pancake business, Standcake, is on the verge of ruin. His son is a cross-dressing geriatric. Controversial photographs of his daughter are circulating. Various factions of parents are aligned against him, but who can blame them: he stole a prosthetic leg and an equipment bus, causing the lacrosse team to forfeit an important game. He kidnapped a feral cat, hoping it would clear his yard of chipmunks while also behaving as his therapy pet. He named it Clint Eastwood. His cat is pregnant. 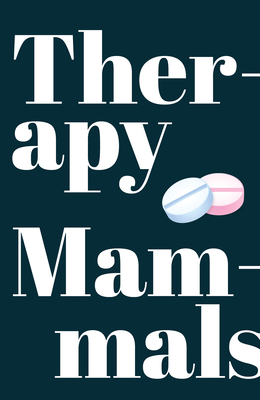 Therapy Mammals is in an intriguing romp through modern parenthood navigating class privilege, digital media, hacker culture and gun violence. Jon Methven is the author of three novels: Therapy Mammals, Strange Boat, and This Is Your Captain Speaking. His work has appeared in Timothy McSweeney's Internet Tendency, the New York Times, New York Magazine, Buzzfeed, The Atlantic, and The Awl. He lives in New York City.